Preventing More Sores. After Julio's pressure sore had healed and he could sit in a wheelchair, the PROJIMO team wanted to make sure that further sores were prevented. They provided Julio with a good cushion, and helped him explore ways to take the pressure off hfs backside at frequent intervals. For Julio, this was not easy. For a person with paraplegia (paralysis of the lower part of the body), pressure relief is easy. He simply uses his arms to lift his buttocks off the seat every 10 or 15 minutes. This allows blood to circulate in the skin and flesh of the backside, thus preventing sores. However, for a quadriplegic person, none of the above positions is simple or comfortable. Without great care and self-discipline, such persons often develop new pressure sores. Spasticity: Hindrance or Help. Many spinal-cord injured persons have a lot of spasticity (involuntary tightening of muscles), especially in their lower body and legs. Spasticity can be very bothersome and make some actions more difficult, such as bending forward to tie shoes, or to relieve pressure on the backside while seated. However, many spinal cord injured persons learn to use their spasticity to good advantage. 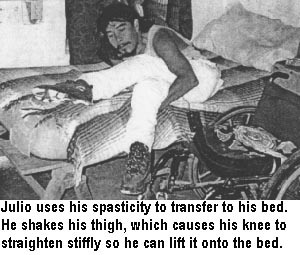 For example, some persons use the spastic straightening of their legs to transfer from their wheelchair to a bed, a car, or a toilet. Others use it to stand or walk with crutches but without leg braces. Each spinal-cord injured person should be encouraged to experiment with new ways to move, position, and control their bodies, and to see if they can find ways to put their spasticity to good use. USING SPASTICITY FOR LIVING INDEPENDENTLY. Using spasticity for dressing. Lying on his back, Julio first bends one knee to his chest, and puts his pants over the foot. Then, he triggers spasticity by tensing his head and shoulder muscles and pushing the leg. His leg straightens stiffly, pushing it into the pants. USING SPASTICITY TO PREVENT SORES. Julio discovered that he can use his spasticity to help prevent pressure sores. He does this by triggering the spastic straightening of his hips and knees. To do so, he leans backward and pushes with his hands against the hand-rims of the wheel (with the brakes on). As his body stiffens, his backside lifts up off the seat of the chair, relieving the pressure. Julio has found that for him this is the simplest and most effective way of weight-shifting to relieve pressure and prevent sores. As with spasticity, some contractures can occasionally be put to good use. Like many persons with quadriplegia, Julio has learned to use the contractures in his paralyzed fingers to grip things. Persons with a lower neck injury (C-6 or lower) tend to have strong shoulders and some strength in arms and wrists, but complete paralysis of their hands. The fingers tend to develop contractures like this. Normally, contractures should be prevented or corrected by range-of-motion exercises. But with quadriplegia, finger contractures should be allowed to develop to some extent, since the bent-fingered stiffness can be useful for picking things up. In this way, Julio can use his paralyzed hands to feed and dress himself independently, and even to propel his wheelchair. Julio has learned how to make the best use of both his spasticity and his contractures. More important, he has become an excellent teacher and peer counselor, helping other spinal-cord injured persons experiment with new ways of listening to and learning from their bodies. He is especially caring with children who feel lonely and lost. 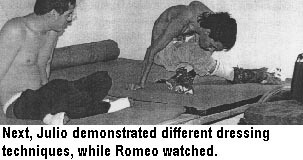 ROMEO was working as an "illegal alien" in the United States to send money to his sick mother back home. Then he became quadriplegic in a car accident. After 3 months in a hospital, he was sent back to Mexico. When he arrived at PROJIMO, Julio soon became his friend, tutor, and role model. In California, a nurse had given Romeo a "transfer board" for moving from wheelchair to bed. 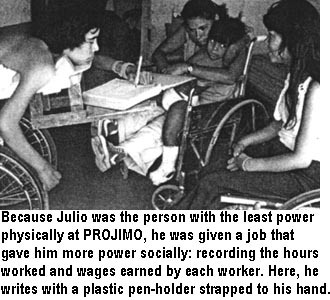 But within 2 days at PROJIMO, Julio showed Romeo to move to and from his wheelchair with no help and without a transfer board. 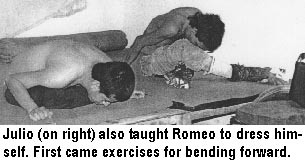 Then Romeo followed Julio's example.